← Best Hive for a New Beekeeper? Overall, a good hive inspection today. Even though it was slightly more humid than last week, the girls were well behaved and fairly docile. The feeder was completely empty again as I did not have time during the week to re-fill, but in a way I think that is almost a good thing as I am able to remove and kill the hive beetles lurking in the feeder. Below is a short video of me checking a frame in the 4th super which is basically all honey. I usually don’t check every frame in the honey super every week to cut down on the time I spend in the hive. I’m really just making sure there is no evidence of hive beetle larvae in the comb and honey. The girls are finally drawing out comb on the frames in the 3rd super even though they still seem to be storing a lot of honey or perhaps the sugar syrup in the cells. 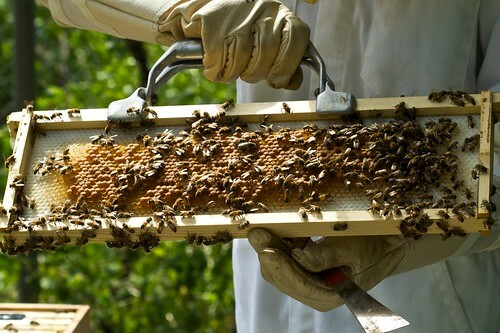 However, there are a few frames with brood on them so hopefully it will be a multi-purpose super with a combination of both brood and honey. I’m still finding queen cells which I’m removing for now. If this keeps up through fall, I may attempt a split during the fall nectar flow here in Texas, but I’ll just play that by ear. I’m hoping they can get the 3rd super completely drawn out with comb before we leave for two weeks at the end of August.